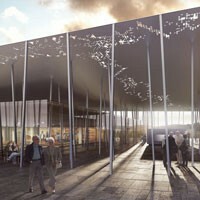 Work on a multimillion-pound visitor centre at Stonehenge is progressing well, English Heritage has said. The £27m scheme, which includes grassing over the road alongside the ancient monument, is due to be complete by the end of the year. Car and coach parks have been laid out and the visitor centre’s roof is ready to be installed, the charity said. Stonehenge director Loraine Knowles said the building was “just one aspect in transforming” the site. Work on the new galleries and facilities, being built about a mile-and-a-half (2.4 km) west of the stones, began in July. Two “single-storey pods” covered by a canopy roof are being built to house an exhibition and education space, cafe, shop and toilets. A section of the A344, which runs next to the World Heritage Site, is due to be closed at the end of June and grassed over. The remainder of the A-road will be closed to traffic in late 2013, to allow a shuttle to operate between the visitor centre and the stones. “The way in which people visit Stonehenge in the future will change,” said Ms Knowles. “The construction of the visitor building is just one aspect in transforming what is widely agreed to be an unsatisfactory tourist and cultural experience. Stonehenge, constructed between 3,000 BC and 1,600 BC, is thought to have been used for a variety of religious ceremonies. It attracts around 900,000 visitors a year – about 70% come from abroad. This computer-generated image just released by English Heritage gives an impression of the superb facilities which will welcome groups arriving at Stonehenge when its new visitor centre opens late next year. The dedicated coach park to the right of the picture will have spaces for 30 vehicles and there is an optional drop off bay in front of the coach reception building – where pre-printed tickets will be available for collection. Just outside, groups will hop on to the transit service for the 2km journey from the visitor centre, to the Stone Circle. Able to accommodate 900 passengers every hour, the transit stops once during the 10 minute drive to the Stones, so that passengers can walk a part of the way if they wish. On arrival at the Stone Circle, they will enjoy a much quieter and greener experience – central to the exciting project being led by English Heritage is the removal of modern clutter next to the monument. This includes the closure of the A344 – which currently runs right past the monument, almost touching the Heel Stone – the removal of ugly high fencing and the existing outdated visitor buildings and car park nearby and the reinstatement of a grassy landscape. Restoration of the landscape is due for completion in summer 2014. 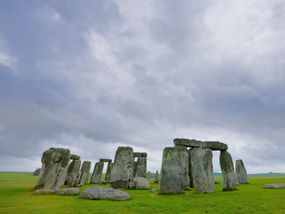 English Heritage is recommending that tour operators and GTOs plan in a dwell time of at least two hours for groups to fully appreciate and enjoy the enhanced experience Stonehenge will offer from late 2013. A pre-booked timed ticketing system will ensure that queues are kept to a minimum. Construction work began on the new visitor centre in July and while the new facilities are being built, it is business as usual at Stonehenge with group visits unaffected. Popular Stone Circle Access visits – outside normal opening hours – are also unaffected and may be pre-booked. From late Spring 2013, coaches approaching Stonehenge will be re-routed to the existing parking and visitor facilities, when the A303/A344 junction closes at Stonehenge Bottom so that work can start on de-commissioning the road. Coach drivers should look out for the diversion signs and a little extra time should be planned in to itineraries to take account of the slightly longer arrival and departure routes. Travel trade clients booking visits to Stonehenge in the future will enjoy the same generous group discounts as now (10% discount for 11 or more people, with a free place for a driver and group leader), as well as a dedicated phone line for bookings/information and dedicated website pages. 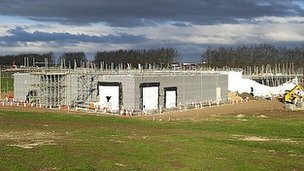 When completed, the new visitor centre will make it possible for the first time to present the fascinating story of Stonehenge on site. The archaeological gallery will feature important objects on loan from local museums and outside will be three Neolithic houses, recreated using extremely rare evidence of domestic buildings from prehistoric England recently unearthed near Stonehenge. YOUNG Britons have hailed Big Ben, Stonehenge and the Tower of London as their favourite landmarks, according to a survey. Buckingham Palace, Windsor Castle and Hadrian’s Wall also featured high among the popular attractions chosen by six to 16-year-olds. Theme parks Alton Towers, Legoland and Thorpe Park failed to make the top 10 list as the survey by hotel group Travelodge revealed that British youngsters were traditionalists at heart who preferred exploring Britain’s heritage. day attraction to make the poll was the London Eye – in at fifth place. 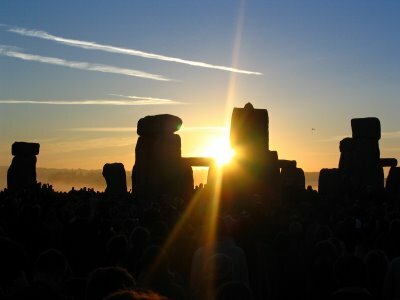 The latest 3D laser technology has revealed new evidence of the importance of the midwinter sunset to the ancient creators of Stonehenge. 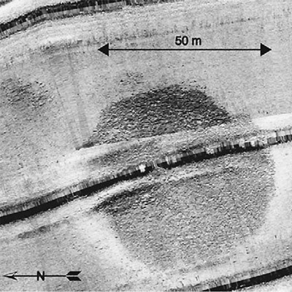 The detailed laser scan and digital imaging of Stonehenge commissioned by English Heritage showed significant differences in how various stones were shaped and worked. The varying techniques and amounts of work confirms not only that the builders intended to align the monument on the axis of the sun at midsummer and midwinter, but also that the view from the north east was particularly important. Researchers said it was clear the stones were meant to be approached from the north east up the ancient processional avenue towards the direction of the midwinter sunset. Approaching and viewing the stone circle from this direction meant the winter solstice sunset had particular importance to prehistoric people, and efforts were made to create a dramatic spectacle for those coming from the north east, experts said. The stones in the outer circle which could be seen on the approach from the north east have been completely “pick dressed”, removing the brown and grey crust of the rock on the surface to reveal the bright, grey-white underneath. But the outer faces of those on the other side of the outer circle were not worked in the same way. The stones facing the north east are also the largest and most uniform, and the lintels are very well-worked and finished compared to those elsewhere in Stonehenge. Stones that flanked the north east/south west axis of the summer and winter solstices were most carefully worked to create straight and narrow rectangular gaps. 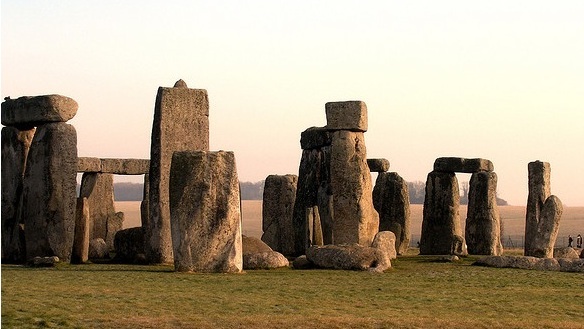 The researchers said that as other stones in the monument have more natural, less neat outlines, it seems that the creators were making a special effort to allow a dramatic passage of sunlight through the stone circle at midsummer and midwinter. If you like your history to come alive and leap out at you off the page, there’s probably no better place to experience it in the whole of England than Wiltshire. Here, the twin mysteries of Stonehenge and Avebury lie in store for those fascinated by the past. This is no dry and dusty text book lesson endured by generations of school children…these are fascinating history hotspots just a few miles apart which have defined our heritage for thousands of years. 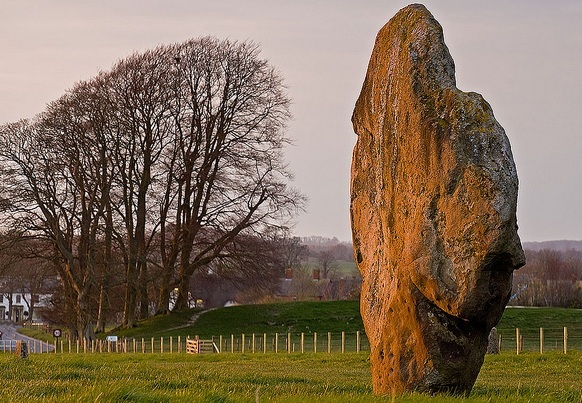 Avebury lies within a 5,000 year old stone circle and its related earthworks, where in Stone Avenue dozens of pairs of standing stones stretch nearly two miles to the ceremonial site of The Sanctuary. To the northeast are hundreds such stones on Fyfield Down, and west lies the Neolithic tomb of West Kennet Long Burrow. Stonehenge, a feat of engineering beyond imagination, is a 4,000 year old stone circle built on a site which can be dated back even earlier. themselves by a thousand years, when a ring of huge timber uprights were erected there. The giant megaliths we see today are made of sarsen – sandstone – each weighing on average 25 tonnes; they were transported from Marlborough Downs 20 miles away, and 30 were arranged in a circle and capped with lintels. Five even bigger structures were subsequently erected within the outer circle, known as ‘trilithons’ and again each supporting a stone lintel. And that’s not all…visitors to Wiltshire are spoilt for choice if they are looking for a glimpse of Britain’s past. Woodhenge is only two miles east of Stonehenge, and is another age-old jewel in the crown of this amazingly historical county; pottery in the area has been dated back to late Neolithic and early Bronze Age times. And Bluestonehenge or Bluehenge is a mere mile away, another prehistoric outpost which in recent years has undergone major excavations. Radio-carbon testing of antler tools found at the site are still on-going; small stone chips found here have been tentatively dated to around 3,000 to 2,400 B.C. – the rock type is thought to have originated in west Wales, 150 miles away. Link Source –Nicki Williams – Nicki Williams writes for leading on-line sports company Gear-Zone, specialists in camping and climbing equipment, waterproof clothing, and sportswear.